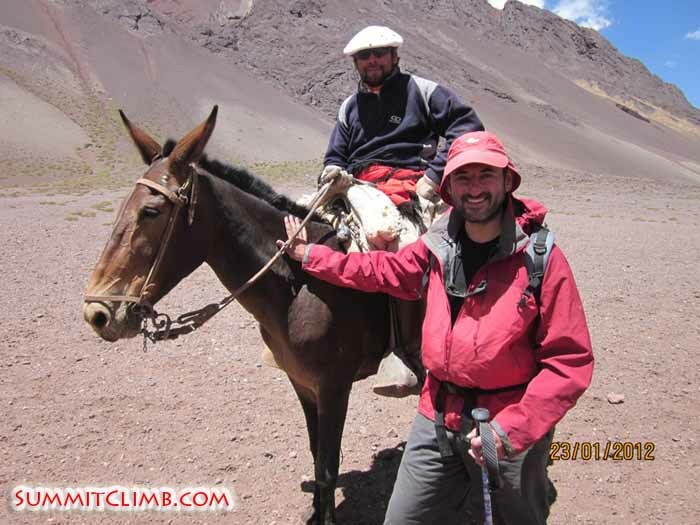 Hi, this is Max Kausch reporting from Aconcagua Expedition February 2012. We are all back safely to Mendoza and happy to inform you that Mr Adrian Lyons has summited Aconcagua on Feb 13th at 3pm. Unfortunately the Russians turned around at about 6200m due to the bad weather conditions. Our summit day was extremely cold and windy but was the only day we had available in our schedule. From the 14th until at least the 20th there will be high winds reaching up to 60km/h on the summit and high camps. Our team had no problems to descend from camp 3 at 6000m. We were all very hydrated and healthy and trekked out of Aconcagua in only 7 hours. The trek from BC to the nearest road totals 32km (20 miles). Hi, this is Max Kausch reporting from Aconcagua. Today is February 8th and our team is doing great! We have reached C1 at almost 5000m yesterday and spent a couple of hours there. Today is our second rest day here at BC and we´ll move to higher altitudes tomorrow. We expect to attempt the summit on Feb 13th then leave BC on the 15th. The weather is still holding up and there are no visible clouds. There are expeditions from all over the world around us. We might not send any news for a while until we reach BC again. Wish us luck! West Face of Aconcagua seen from BC (Max Kausch). View of Camp 3 6000m (Thomas Pfeiffer). Hi, this is Max Kausch reporting from Aconcagua. Today is Feb 6th and we are all safe in basecamp. Our team is acclimatizing very well. Today we all went to see the basecamp doctors and our members got checked. The doctors were actually very surprised when reading the O2 saturation levels and pulse rate. They said we are doing VERY well considering we got to this altitude 24 hours ago. Oleg and Nokolay are teaching us Russian and we are teaching them some English. On the 4th we visited the south face and had perfect weather. So far we are very, very lucky with the weather as we haven´t seen one single cloud yet! Andrew and Adrian are also doing very well and getting used to the mountain environment. Tomorrow we´ll start moving up the mountain and take a load to 5000m then come back to sleep at BC. We are planning to leave BC for the summit push on the 8th and might try the summit on the 13th. Wish us luck! View of Camp 2 5600m Thomas (Pfeiffer). 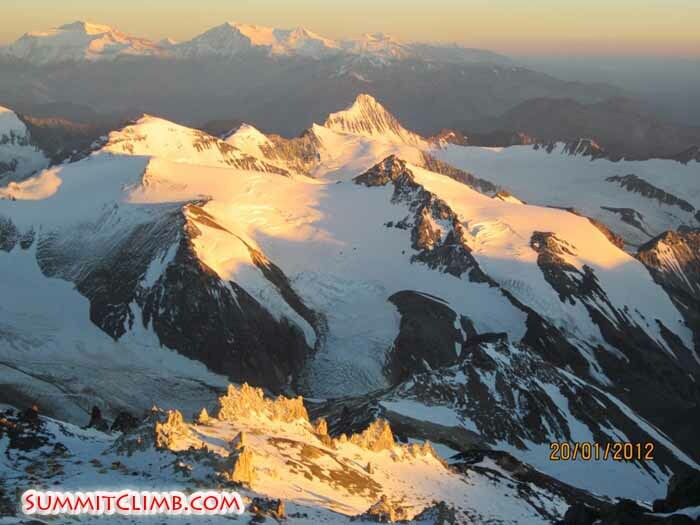 Sunrise from 6600m (Michael Tomordy). 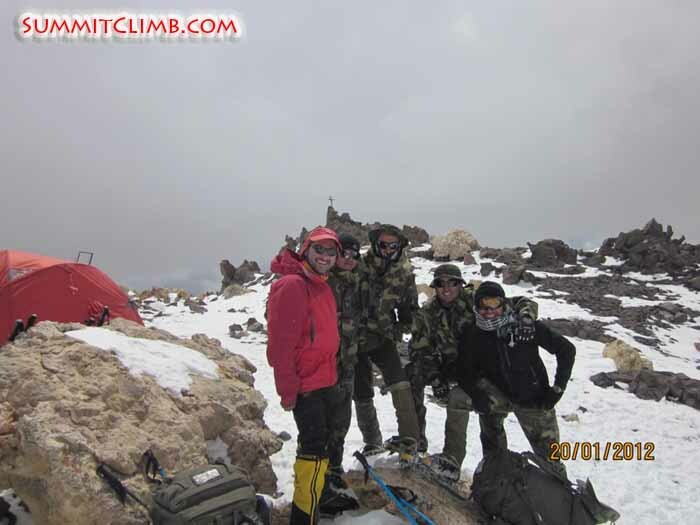 This is the SummitClimb February 2012 Expedition to the highest mountain in the world outside the Himalayas. We are leaving Mendoza today to start our journey to this very interesting peak here in Argentina. We plan to sleep at 3000m tonight, then move to 3400m tomorrow. 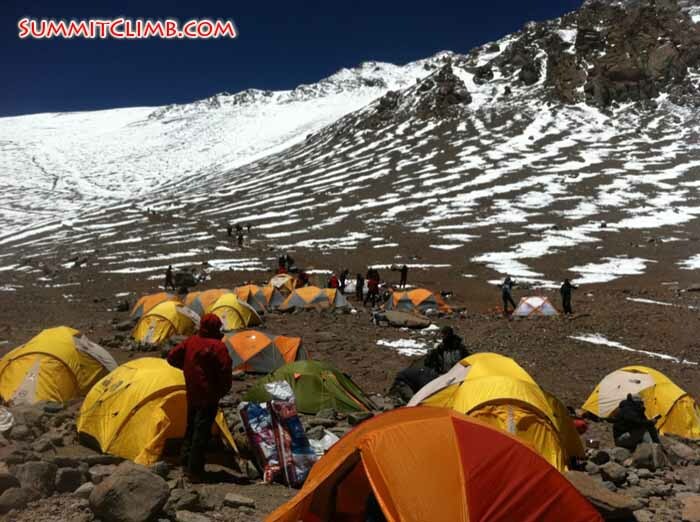 On the 4th we plan to visit basecamp at the south face of Aconcagua, for a slow but efficient acclimatization. The weather here is fantastic and our members loved Mendoza. Michael Tomordy chatting with another expedition (Thomas Pfeiffer). Michael Tomordy and a mule driver (Max Kausch). We’re back to civilization after a summit attempt to Aconcagua on January 20th. Unfortunately we couldn’t reach the summit and we had to return to camp 3 from 6720m (250m below the summit). Ms Trudy Healy had to leave BC on January 17th due to health reasons. She was rescued by a helicopter and went to Mendoza on the 18th. We believe Trudy had a strange case of HAPE. She was checked by the BC doctors in the morning of the 17th, then at 2pm of the same day she was diagnosed with HAPE. The rest of the team really missed Trudy during the summit attempt. The 16th was extremely windy and about 4 tents were blown away. One of them was a SummitClimb tent. After being informed by radio that our tent disappeared, I went to camp 1 trying to find it, then climbed 350m on the west face hoping to find it. Unfortunately nothing was there. After borrowing some of the lost equipment from other expeditions, we decided to push for the summit using the weather window on the 20th. Michael, Thomas and I pushed on to Camp 1. We had to go for a fast push to camp 3 as a storm was coming on the 21st. We had an amazing sunset from Camp 1, 4950m, on January 17th. Next day we moved our camp to 5600m. The 2nd camp is huge and very safe. Our porters brought a load with extra gas and food so we had a very comfortable time at 5600m. 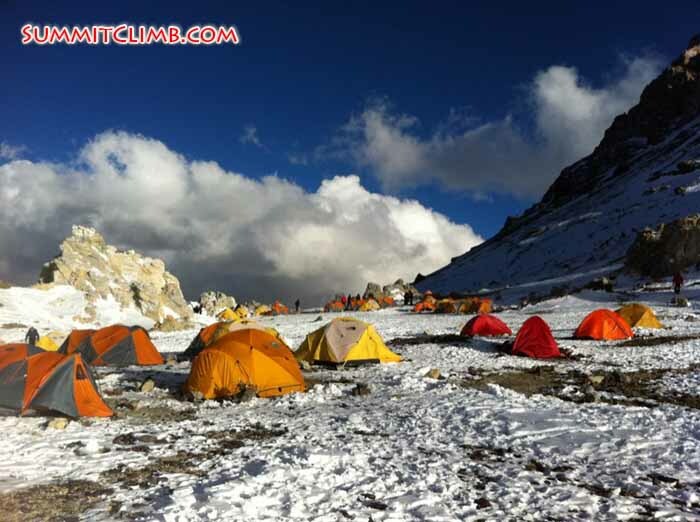 Camp 3 (6000m) was established on the 19th. We moved our tent and equipment up the mountain for the last time. After spending 12 hours there, we left camp for our summit push at 5am. We’ll write more from Mendoza. Michael at Camp 1 (Trudy Healy). 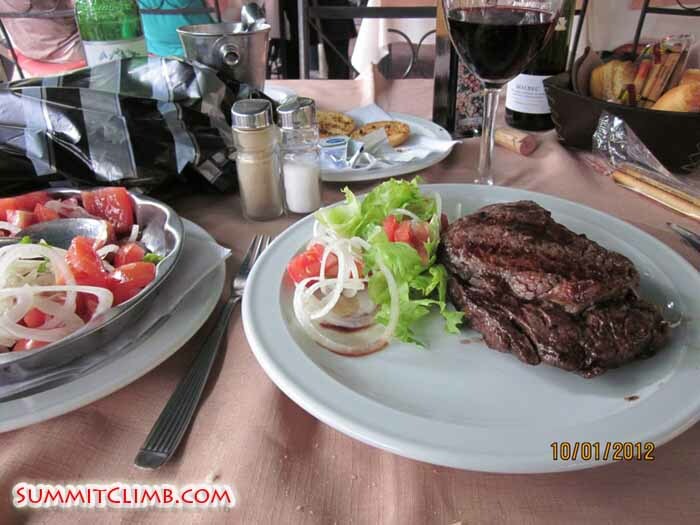 Having a steak in Mendoza (Michael Tomordy). Hi, this is Max Kausch writing a dispatch for the Aconcagua January 2012 SummitClimb Expedition. Today we´re pushing for the summit. We had some regular weather so far. Pretty much every day was cloudy and windy. We carried 2 tents and some food to camp 1 but a wind storm took our tent with everything inside. We managed to borrow some of the gear and will push for the summit today. We expect to summit around the 20th then move back to BC with news on the 21st. Apparently there´s a huge storm coming on the 21st. We apologize for the lack of communication. Internet here at BC hasn't been working properly lately as a storm has damaged a few antennas. Team heading up from camp 1 (5,000 metres/16,400 feet) to camp 2 (Ted Alexander). Hi, this is Max Kausch writing a dispatch for the Aconcagua January 2012 SummitClimb Expedition. Today is January 10th, 2012. We're at Penintentes, 2400m/8000ft high and on the way to Aconcagua. Our members are very happy after they found out that SummitClimb pays for a 3 star hotel in Penitentes! Mendoza was at least 38¼C/100¼F when we left. And after only 3 hours on the road we hit 12¼C/58¼F! We spent the morning sorting out paperwork and permits in the beautiful and sunny Mendoza. We ate our last steak and the last local red wine before hitting the mountains. We left at 3pm using a private transport to Penitentes. On the way we saw very deep valleys dug by glaciers at least 9000 years ago. There is a river on the side of the road and we drove by it for 3 hours. 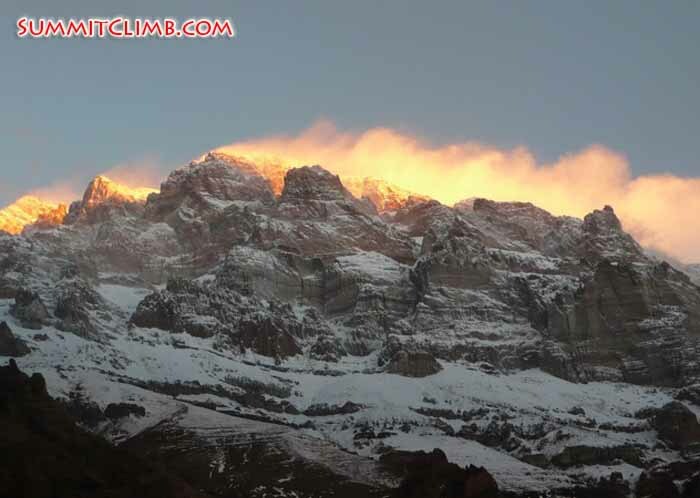 Tomorrow we'll start heading to its source: Aconcagua. Part of the water comes from the south face of the mountain, which we'll visit in 3 days from now. The rest of the water comes from the upper Horcones valley and follows the route we're climbing. It is quite amazing to follow the course of such a huge river! Initially our goal is to follow the best possible acclimatization plan. We will take it very easy at the first part of the climb. This will give us a very solid acclimatization and raise the chances of reaching the summit. Trudy, Michael and Thomas really look forward to seeing Aconcagua for the first time tomorrow morning. Wish us luck! 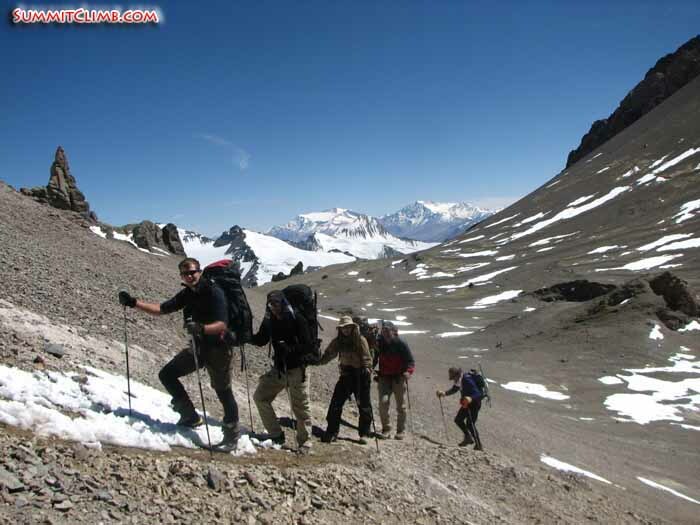 Our awesome and friendly team on the trek to Aconcagua basecamp (Max Kausch). Hi, This is Max Kausch writing a dispatch from Mendoza/Argentina for the Aconcagua January 2012 SummitClimb Expedition. Today is January 9th and everyone already arrived to Mendoza. The climate here is amazingly hot and all people are outside, having meals with their families and enjoying the warm nights. All the streets here have running water by the trees. 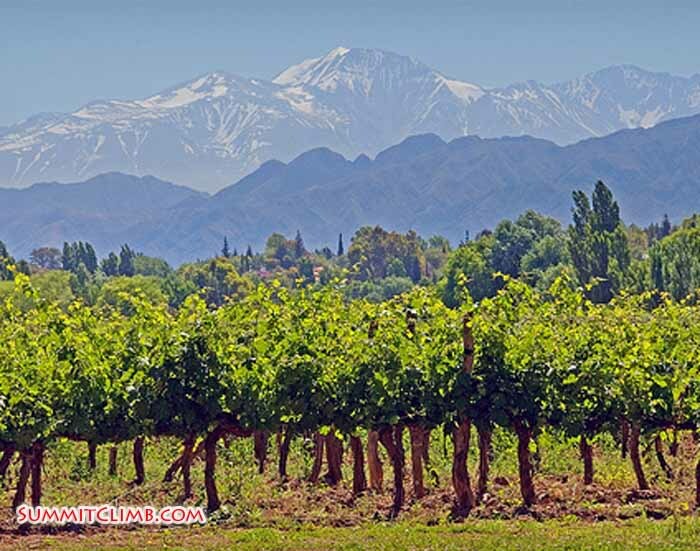 Mendoza is pretty much an oasis in the squeezed between the Pampa Seca desert and the Andes. We can even see a few mountains from the highest parts of the city. Our last member Mr. Thomas Pfeiffer arrived today after flying half way around the world! We are leaving Mendoza tomorrow early afternoon an sleeping at Penitentes, 2400m. A winery in Mendoza with the 6000 metre Plata mountain range in the background (Max Kausch). Hi, tThis is Max Kausch writing a dispatch for the SummitClimb Aconcagua January 2012 Expedition. Mendoza is very sunny and warm right now and I’m very pleased to say that our expedition officially starts tomorrow. Ms Trudy Healy from US is already here! She arrived today on a flight from Santiago. Trudy has climbed with SummitClimb before. She was on a Everest North Col expedition last year and reached 6800m! 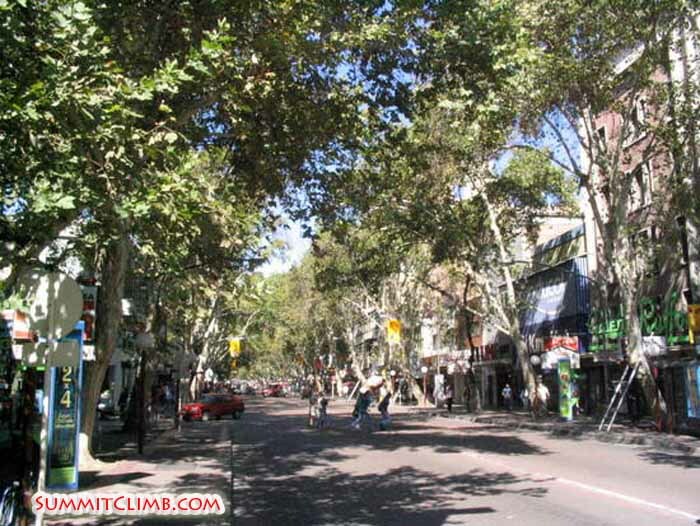 Mr Michael Tomordy is on the way to Mendoza right now and we’ll meet him in a couple of hours. 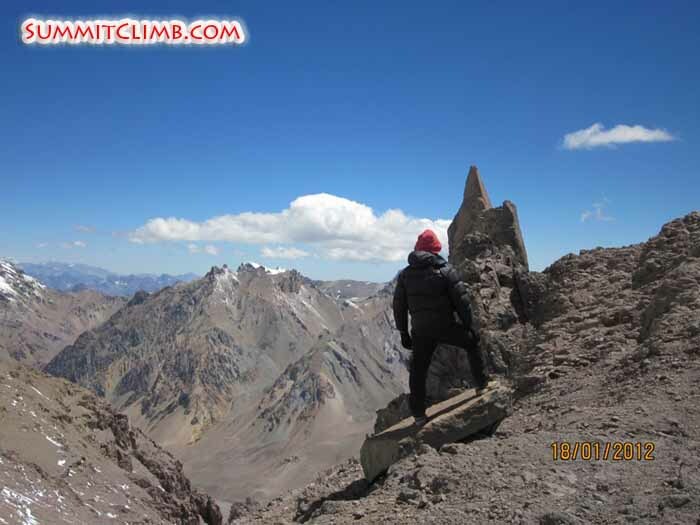 Michael has climbed Cho Oyu with SummitClimb in 2010. Beautiful Mendoza, Argentina, our launching point for Aconcagua (Max Kausch).